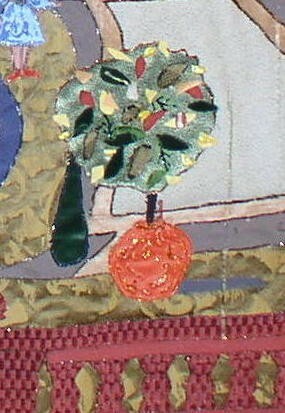 Below is a wallhanging made some 20 plus years ago. It was an experimental piece based on an old black and white picture of a National Trust building. 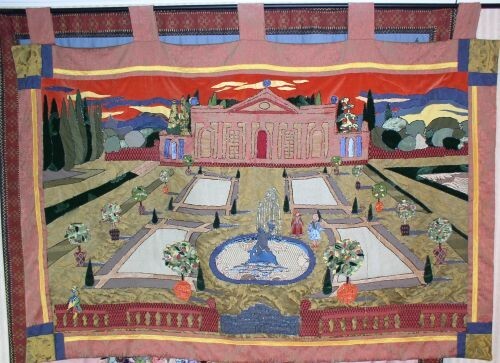 We wanted to create our own version of a tapestry using piecing techniques and embellishment. The difference, Appliglue was to be our thread of choice. This was a combined effort with friends who popped in to dabble or simply to drink the tea. We called in friend Hillie Reid, an artist of note, towards the end because we knew she wouldn't be able to resist the urge to add colour. After a very short obsevation she tutted and set to enhancing it with painterly effect! 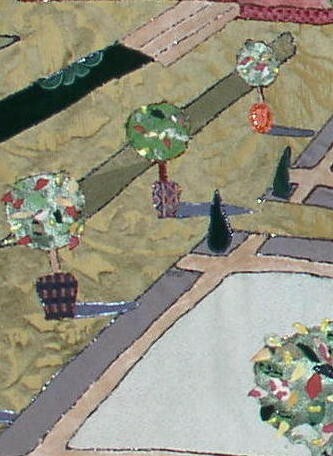 She added shadows, put leaves on the trees, perspective in the sky through clouds of colour and more greenery of various heights. 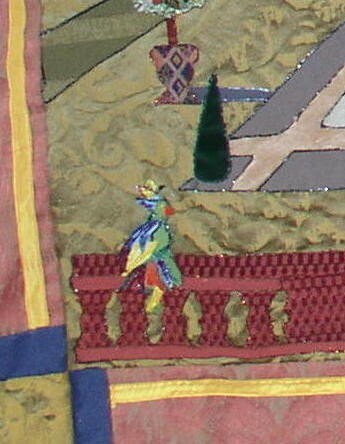 The colourful bird was included on the wall and the gates were given depth. Because it was done such a long time ago, we haven't yet come across the photos that tell the story yet - but we will! Detail of the National Trust building and the sky scene. Hillie also added colour to the outer windows. 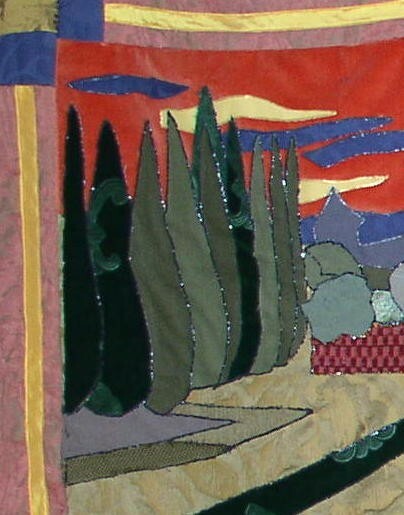 Note the shadows, detail of different coloured fabric leaves on the trees and the colours in the clouds. Oh, to have such a good eye! What a difference. Most of these fabrics were scraps from an upholsterer and curtain maker.